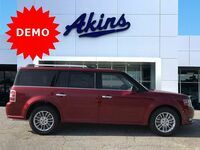 The 2019 model year has officially begun here at Akins Ford near Atlanta, GA, thanks, in part, to the arrival of the new 2019 Ford Flex lineup. 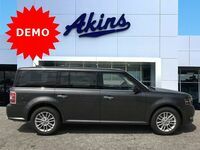 Known for its unique exterior style, roomy and comfortable interior, powerful and efficient engine options, and wide array of advanced new safety, technology, comfort and convenience features, the 2019 Flex lineup is the perfect choice for anyone looking to purchase a new SUV. But if you’re looking to purchase a new SUV, you want to make sure you’re getting the best of the best – which is what the 2019 Flex lineup is. Now, you could just take our word for it, but since you want some evidence to go along with that claim, here’s our 2019 Ford Flex versus 2018 Chevy Tahoe model comparison. Everything listed in our 2019 Ford Flex lineup versus 2018 Chevrolet Tahoe lineup head-to-head comparison table above shows you why the 2019 Flex is a better SUV than the 2018 Tahoe, but the thing that probably sticks out the most is the fact that the 2019 Flex lineup has a starting price over $18,000 less than the starting price for the 2018 Tahoe lineup. That’s a lot of money that can be used for other things – like taking your new 2019 Flex on the adventure of a lifetime. You likely also noticed how the 2019 Ford Flex lineup offers a ton more passenger and cargo space when compared to the 2018 Chevy Tahoe lineup. More specifically, the 2019 Ford Flex lineup provides 155.8 cubic-feet of passenger space and 20 cubic-feet of cargo space when all the seats are in place, whereas the 2018 Tahoe lineup provides only 122.4 cubic-feet of passenger space and only 15.3 cubic-feet of cargo space when all the seats are in place. The final note in our comparison table highlights the 2019 Ford Flex lineup’s standard Ford Co-Pilot360 suite of safety and driver assistance features. This suite has it all, whereas the 2018 Tahoe lineup makes you pay more for advanced safety and driver assistance features. To learn more about the 2019 Ford Flex lineup, please reach out to our Akins Ford staff near Atlanta, GA.